We work hard to make sure that we take care of all of our pets here at Crossed Paws Animal Haven, Inc. But, unfortunately we can't do it without people like you and your donations of time and money. So, if you ever feel like you want to be a part of our family and help some of the best animals around, check us out. We know you've always wanted a dog, cat, or other awesome animal. And now's the time friends! We are here to help you get ready for your new family member, as and as soon as you're ready to take the big plunge. Owning an animal is, after all, one of the most gratifying things you can do. 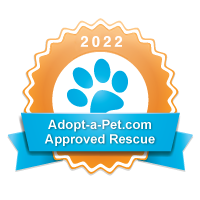 ​Thank you to Petfinder Foundation for awarding us a Kong Product Grant!! ​​Thank you to Petfinder Foundation for awarding us The Orvis Animal Care Grant!